The writing on the tote translates as: “Equipment of Ofunato City”. Ofunato is a city in Iwate Prefecture, Japan. 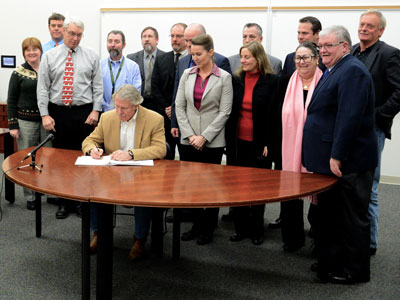 Oregon's Governor, John Kitzhaber, signed the State of Oregon Japan Tsunami Marine Debris plan on Dec. 18, 2012. 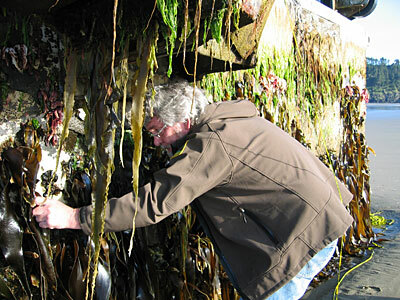 ODFW biologist taking samples from the 70-foot-long dock that washed up north of Newport. Jan 20, 2015: A commercial fishing tote washed ashore on Beverly Beach, just north of Newport. The writing on the tote translates as: “Equipment of Ofunato City”. Ofunato is a city in Iwate Prefecture, Japan. Dr. Gayle Hansen, Hatfield Marine Science Center, has collected specimens from the tote for the identification of any non-native species. 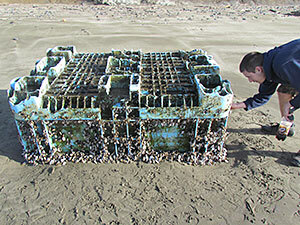 Contact Steven S. Rumrill, Shellfish Program Leader, Oregon Department of Fish and Wildlife, (541) 867-0300 Ext. 245, for more information. Gayle Hansen photos. April 2013: Five live striped beakfish (Oplegnathus fasciatus) arrive on Washington coast in a wooden skiff presumed to be tsunami debris. March 2013: Several small boats suspected to be tsunami debris washed up on Oregon coast; all were removed to landfills. March 10, 2013: A section of a concrete dock was placed at the OSU Hatfield Marine Science Center in Newport as part of a tsunami awareness exhibit. March 13, 2013: Japanese officials confirmed there were four floating docks at the Misawa Fishing Port when the March 11, 2011 tsunami struck and three were washed away. One dock washed up on June 5, 2012 on Agate Beach in Newport, Oregon. One washed up in December 2012 on the Olympic Peninsula in Washington, and one was sighted off Hawaii in late September 2012. June 19, 2012: Through a competitive bidding process and consultation with ODFW, Oregon Parks and Recreation District chose to demolish the Agate Beach dock, rather than tow it to another location, increasing the risk of spreading invasive species. 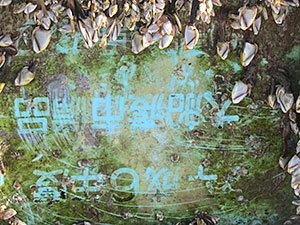 June 8, 2012: Buoys and other debris related to Japan Tsunami have been washing up on Oregon’s north coast for the past week. June 6-8, 2012: Oregon Parks and Recreation District, ODFW and Oregon State University worked together to identify organisms on the dock and remove as much biological material as possible. Several of the organisms on the dock were identified as being nonnative to Oregon and potentially invasive. Species of great concern included: Wakame seaweed (Undaria pinnatifida) and North Pacific seastar (Asterias amurensis). June 5, 2012: Dock washed up on Oregon’s Agate Beach in Newport. The dock had a thick layer of living organisms on it.